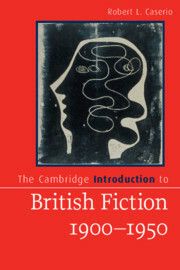 My Cambridge Introduction to British Fiction, 1900-1950 is especially motivated by my experience in the classroom. A perennial teaching opportunity presents itself, I’ve found, in the assumption—held by younger readers—that “themes” in fiction are separable from the form of the narratives in which they appear. The assumption tends to neglect the art of fiction. It also tends to hide the fact of fiction’s difference from non-fictional discourses. To respond to those tendencies, the Introduction emphasizes the fusion of any novel’s content with how it tells its content. It asks students to be as interested in the “how” of the telling as in the “what” of the told. I designate the “how” by calling it “treatment” rather than “form.” Students tell me they feel less comfortable using the latter term, because it seems more abstract to them. My accentuation of “treatment” complements the “modernism” that my Introduction’s slice of literary history necessarily engages. It’s the modernist writers who insisted that readers take account of the ways in which novelists and short story writers shape their representations. Modernists issued multiple declarations of ideas about the nature and function of fiction. I survey those ideas in the Introduction’s second chapter, where I foreground them for their own interesting sake, and also in the hope of laying a foundation for theories of literature that students will go on to encounter elsewhere. I’ve designed the Introduction in the hope of laying other foundations of study. The book’s fourth chapter orients students to fiction’s involvement, in the first half of the twentieth century, with non-fictional discourses: anthropology, psychology, science, and history among them. The Introduction’s last chapter rehearses the arguments between rival economists that underlay the creation of the welfare state after World War Two, and that remain relevant to today’s controversies about neo-liberal capitalism. Wartime and postwar British fiction, unfolding alongside the Labour Party’s attempt to use socialist means to forge a new public good, creatively explored the pros and cons of collectivity. My two favorite aspects of the Introduction are I think useful not only to beginning students but also to graduate students, to general readers, and even to scholar specialists. I introduce (at close range) more than one hundred writers who deserve our continuing attention. Other “introductions” are narrowly selective in comparison. My comprehensive gathering means to expose readers—even if they are at the very start of their study—to the richness and variety of the field. After all, developed scholarship (for example, in any issue of the journal Modernism/modernity) draws on that variety. Hence The Cambridge Introduction’s reach gives its readers a boost in the direction of advanced learning. My other favorite aspect of the Introduction is its commitment to popular fictional genres. Chapter Five surveys the most sought-after kinds—adventure fiction, detective fiction, spy fiction, horror fiction, science fiction, romance, and fantasy. I show that modernism is not antithetical to those entertaining modes, but contributes to all of them. Of course, narrative fiction in general is the supreme entertainer: simultaneously playful and earnest; paradoxically untrustworthy and truthful. The Introduction means to keep its readers focused on that fascinating doubleness.